The idea for the creation of a branch of the internationally renowned Alliance Française in Trinidad was first proposed by the then Consul General of France, Jacques Leguèbe, to Frank Agostini, the prominent agriculturalist and businessman, and himself a descendent of French immigrants to our country. Despite their relatively small numbers, the colonists have had a great influence on the culture and history of Trinidad and Tobago. There was a lot of enthusiasm for the plan in the local community,and it was relatively easy to gather members for the first AGM on January 13, 1951. Frank Agostini was elected the first President, and the first classes were held at borrowed premises at Cascade Road, in St. Anns. These proved so popular that we were able to establish our own headquarters in 1958 at 89 Pembroke Street, where we were lucky enough to find a wonderfully-preserved example of colonial architecture for rent, complete with a spacious verandah and large garden. The satellite organization in San Fernando opened its doors in 1959, and merged with the northern branch in 1989 to form the Alliance Française of Trinidad and Tobago. In 1990, we crossed Pembroke Street to rent No. 76, and finally purchased our own home at 17 Alcazar Street in 2001. Thanks to the hard work of the various Boards of Directors, the Alliance Française quickly became a centre for culture and language learning. The artistic and business communities met regularly for exhibitions, dinners, concerts and francophone events, and we have enjoyed particularly enthusiastic support from the various diplomatic representatives. You would have realized from the dates that the AFTNT is « older » than Trinidad and Tobago, and in fact, the annual National Day Celebrations (or the Bastille Day Fete, as it is popularly known) were hosted by the AFTNT pre-Independence; after 1962, the French Ambassador-in-residence quite naturally continued the custom. 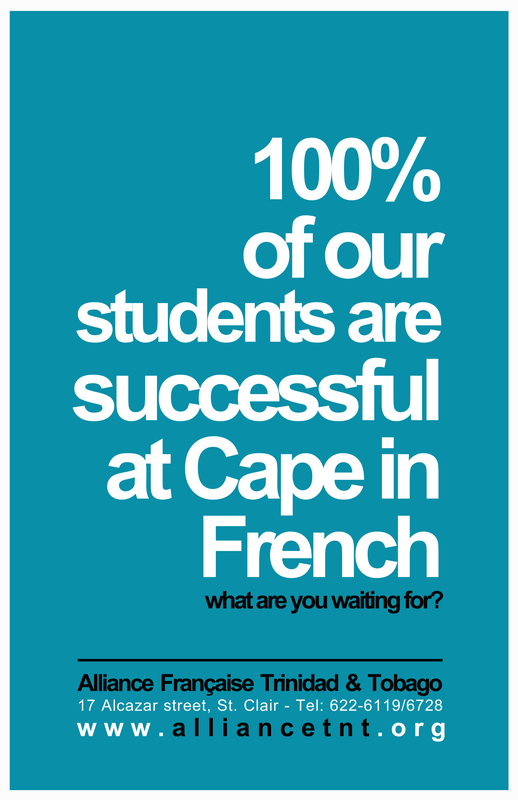 The Alliance Française remains the principal centre for French language teaching outside of the traditional educational system. We collaborate closely with the French Teachers Association and the Centre for Language Learning, providing training opportunities for local teachers at all levels, classes in French and English for expatriates and locals alike, and in the last few years we have expanded our offering to include a Kids’ Club to introduce French to youngsters from the age of 6. Our Resource Centre uses some of the latest educational technology as well as new applications for traditional techniques for immersion teaching. Our language exchanges are very popular in both directions, thanks to our connections in Guadeloupe and Martinique. And as a bonus, members, students and visitors can watch programmes from France and French-speaking countries on Canal Satellite in our lounge area.